Items that are already owned cannot be purchased again from shops, unless they have been purchased with a different ability from SplatNet 2 or been ordered from Murch with a non-default ability. Gear can be ordered through Spyke and Murch. While interacting with other players in Inkopolis Plaza (Splatoon) or Inkopolis Square (Splatoon 2), their gear can be ordered. After midnight according to the system clock, Spyke or Murch will have the next ordered item available for purchase. Ordering gear through SplatNet 2. Murch adding an ability slot. Version 2.8.0 of Splatoon featured CoroCoro-themed promotional gear. This gear became accessible in-game from shops and can be ordered through Spyke. On 15 April 2019, CoroCoro Comic included unique product codes that could be used in the Nintendo eShop to redeem promotional gear in Splatoon 2. These CoroCoro Comic exclusive gear items can only be used with the Japanese version of the game and cannot be ordered through Murch. If anyone applies for a Nintendo Switch Online plan (or a family plan), they will be given a code (8 codes if the plan is a family plan) to redeem the exclusive Online Gear on the eShop, in which a box will appear in the middle of the square containing the items. These exclusive gear items cannot be ordered through Murch. The Nintendo Switch News app also gave away exclusive gear to those who started Splatoon 2 via special news articles of certain worldwide Splatfests. These exclusive gear items cannot be ordered through Murch. Famitsu also gave away codes for promotional gear for those who purchased the Fourth Splatoon Koshien Fan Book. These can only be used with the Japanese version of the game and cannot be ordered through Murch. With the release of Splatoon 2, a promotional collaboration with licensed merchandise producer HORI saw the HORI Splatoon 2 Splat & Chat Headset, for use with the Online Lounge. 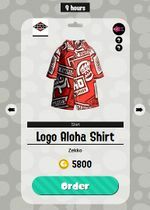 An in-game gear item with the same design is accessible in-game from shops and can be ordered through Murch. The King of Games is a brand of apparel by Japanese apparel manufacturer Editmode that produces officially-licensed Nintendo clothing. From launch, Splatoon has included a KOG brand that sells in-game analogs to real-world products. This gear is accessible in-game from shops and can be ordered through Spyke. On 16 March 2018, a Splatfest was announced for Splatoon 2 in Japan with a theme inspired by real-world Nike shoe products. As part of the promotion, two new gear items were added to the game. This gear became accessible in-game from shops, could be ordered through Murch and were immediately listed for order on SplatNet 2. Version 2.0.0 of Splatoon featured gear inspired by Squid Girl, a Japanese manga and television show. This gear became accessible in-game from shops and can be ordered through Spyke. This page was last edited on 24 April 2019, at 18:39. This page has been accessed 1,067,688 times.